Please consider adding walks or daycare during your pets stay! 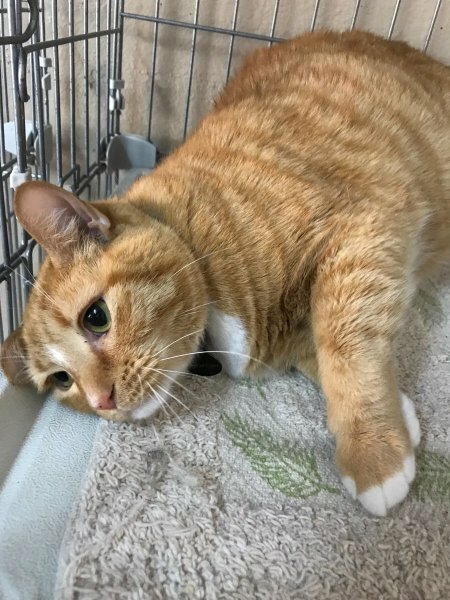 We really enjoy pets and boarding can be stressful on many of them, especially during peak seasons when it can get very loud in the boarding area. We want to remain affordable for everyone, but we also want to see your pet happy. Dogs stay in their runs unless you opt for walks or daycare (time outside). This is not an uncommon practice among boarding facilities. Our walks are only $5 and daycare is only $8 for full day or $6 for half days. One of these is required at least once a week, but we encourage you to include them as often as you can. When you add walks or daycare (Daycare is for spayed, neutered. and social pets only) to your pets stay, it greatly decreases their stress level and really adds enjoyment to their stay. Check in is between 7:00 AM and 5:30 PM Monday-Friday and 7 AM-11:30 AM on Saturday. We close at noon on Saturday. Any check in after these times causes employees to work late and will result in a $10 fee per pet. Check out is before noon, unless your pet is being bathed. After noon check-outs result in an additional day of boarding charged to your bill. 2nd dog in the same kennel is 25% off base boarding rate. We do offer discounts on stays of 30 days or more, however, the pet must be spayed or neutered to qualify. ​We offer a 10% discount on boarding for Active Duty or Retired military, Law Enforcement, Fire Fighters, Seniors 65+, college students, and teachers. Must show proof to get discount. Discount applies on boarding only on the first pet (2nd pets are already dicounted 25%). If dogs must be fed separately, there is a $2 per day separate feeding charge. If we have to feed our food, there is a $2 per day/per pet charge. Outside time can be daily, every other day, every third day, or once a week. Young or boisterous dogs should go out daily. Walks-$5 each: 15-30 minutes off leash in one of our fenced in yards under the supervision of an employee: no other dogs in the same yard except siblings. Group Walks-$5 each: 15-30 minutes off leash in one of our yards with appropriate dogs. Group walks are not always available. Doggy Daycare-$8 per day (3-5 hours of outside play with other dogs. KONGsicles-$1-$3 Each fill. Price based on size. Dry Dog Food: $2 up to 4 cups. $1 each additional cup. We require proof of current Rabies, Distemper/Parvo, and Bordetella vaccines for dogs and proof of current Rabies and FVRCP for cats. Puppies and Kittens MUST have completed ALL their boosters prior to boarding. All shots should be given at least 7 days prior to boarding or they are ineffective. All pets MUST be on a flea and tick preventative! We will accept Titers within the last three years in lieu of DHPP. We sell the bordetella nasal spray vaccine here for $15, if we have it in stock, but you have to administer it and it isn't effective for 7-10 days. They can still board, but its better if you get the vaccine sooner. Pets WILL NOT be accepted without all vaccines being current. It is not Spa for Paws responsibility to update you on expired vaccinations or to obtain vaccination information from your vet. Please label all food with your pet's name and bring it either prepackaged by meal in zip lock baggies or in a sealable, air tight, waterproof container. We can feed your pet up to twice a day: about 7:30 am and about 4 pm. Your pets must be in good health, hydrated, and have completed their puppy/kitten series to board. We do not accept pets that need to wear an elizabethan cone, have open wounds, stitches, staples, or bandages. We can give oral medication and insulin. Large kennels are 4x20', medium kennels are 3x10', and small kennels are 3x4'. When we are full, kennel placement is based on the size of the dog. Please be accurate when giving us your pets weight. If you book a room for a 30 pound dog and show up with a 60 pound dog, we may not have space available and you may be turned away. All kennels are climate controlled and cleaned thoroughly with a multi purpose, industrial grade disinfectant. Classical music and lavendar diffusers are run intermittently throughout the day. The ground is cement on all runs. Dogs are given either a Kuranda bed or a Perla bed with blankets to make their stay more comfortable. 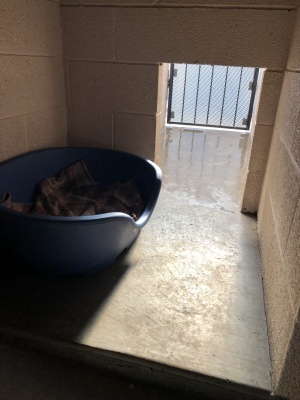 Our small kennels were replaced in November, 2018 and are safe and secure. Dogs under 25 pounds are in small kennels during peak seasons like Christmas, New Years, 4th of July, Spring Break, and Thanksgiving. Each pet is given paper, a pee pad, fresh water, and a perla bed with blankets along with a toy and any edible treats you've sent along. 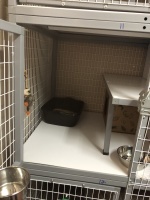 Our small kennels are about 3.5'x4' and cleaned twice a day. Medium runs are about 3x10. Shown is a medium run with a Perla bed with blankets. Dogs are also given chew toys to help keep them occupied. You may bring any edible treats you think will help make your pets stay more comfortable. Large runs are 4x20. Dogs eat and sleep in the front and use the back to stretch their legs or relieve themselves. During non-peak seasons, all dogs are in large kennels. During peak seasons, placement is based on the size of the dogs. Shown is a large kennel with a Kuranda bed. Kuranda beds are very comfortable and durable. 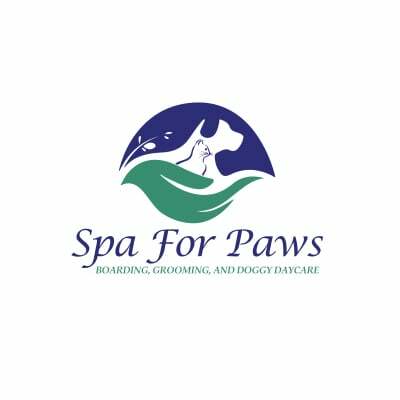 Even blanket shredders can now be comfortable at Spa for Paws! Cat boarding is $12 per night per cat. Cats must be current on rabies and FVRCP. 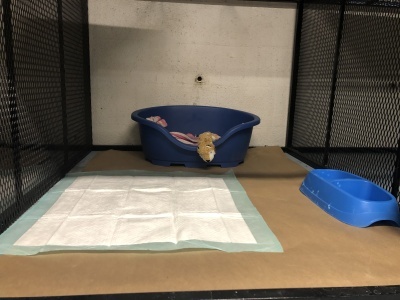 Other critters cost $10 per night and require no vaccinations, but you must provide appropriate cages and feed for their stay. 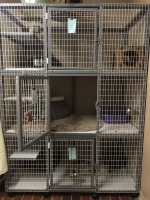 We have cared for birds, rabbits and other rodents, and snakes. We don't accept fish. 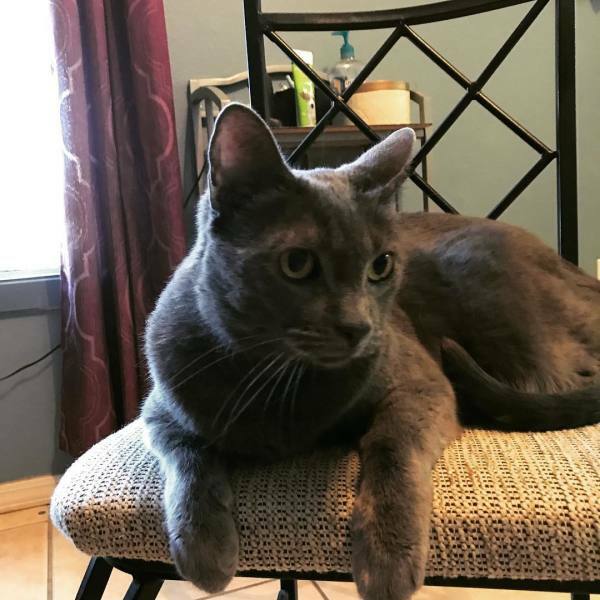 ​Your cats food MUST be placed in a chew proof container or preferably placed in small plastic baggies that can then be placed in our chew proof plastic containers. 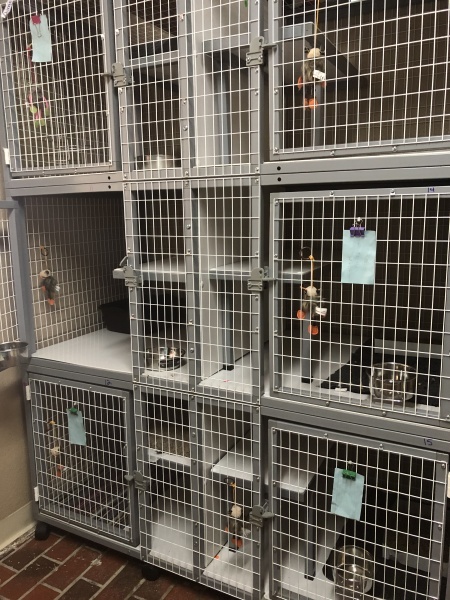 We have 15 cat cubbies to accomodate boarding cats. Each cubby contains a shelf, a place to hide, a litter box, a rug or mat, catnip toys, and food/water bowls. Double cubbies can fit multiple cat households. We prefer to keep it 2 cats per double cubby. 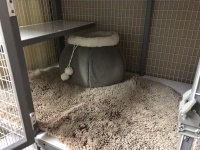 Each double cubby has a hide, a lounge shelf, litter box, toys, a rug or mat, and water/food bowls. Single cubbies are for single cats and have a personal lounge shelf, hide box, litter box, litter mat, catnip toy, and water/food bowls. Single cubbies can be altered in to double cubbies should the need arise. Our cat runs are secure and comfortable. 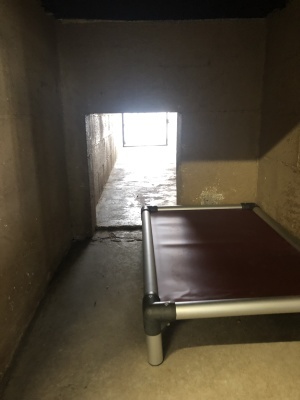 Each run has a ledge for cats to lounge on, a litter box with pine litter that is replaced every day, a place to hide, a litter mat or carpet, a catnip toy, and food/water. Cats are let out for play time on most days, and may even socialize with other cats if they are friendly. There is no set times for this and no extra charge. It is very low risk, but there is still some risk. Please inform the front desk on check in if you don't want your cat let out to play. What is required for boarding? What is kennel Cough (Bordetella)? Bordetella is a generic term for any one of many upper respiratory infections. Unlike rabies, the vaccine does not always prevent it, but it will help their body fight it off. It is an airborn virus that spreads like the flu. Some dogs can carry it and show no signs. If your dog is affected, they will get a chesty cough and possibly a snotty nose. The virus will run its course in 1-2 weeks and can be treated by your vet with medication. It is very rarely serious and it seems like the more undersocialized the dog, the more likely they are to contract it. We do not pay vet bills for kennel cough as there is no way to 100% prevent it. Vaccination records, your dogs food, and any treats you want them to have, pre packaged and labled for easy feeding. Any dog that runs out of food will be switched to house food and charged the house rate. We require proof of all shots to include rabies, distemper/parvo, and bordetella (also known as kennel cough) for dogs and Rabies and FVRCP for cats. Please bring their current vaccines if you are a first time boarder or if you recently got your dog or cat their boosters. If they do not have all their vaccines, they will not be allowed to board. We brought the exact amount of food our pet needed-why is there food left over? Can we bring beds or toys? What can I expect when I pick up my pet? Many pets don't eat well in a boarding facility. Sometimes it's only the first day or so, and sometimes they only nibble their entire stay. We may add wet food in order to stimulate their appetite unless they have allergies or you've asked us not to. If you'd like us to throw away your food instead of keeping it, just let us know and we'll do that. We don't call unless they are on a total hunger strike for days. A loss of appetite during boarding is not uncommon. We don't like to accept outside items because they can become lost, dogs like to tear up beds when boarding, or they poop on them. If a blanket or bed gets wet, which is not unusual, we toss it in the washer. There is no tracking individual bedding, blankets, or toys from that point. If you insist on bringing your own items, we are not liable for their loss or damage. A lot of excitement and possibly some diarrhea. You pet may also experience some short term behavior changes and loss of appetite. If your dog is an inside dog and has soft pads their pads may get roughed up on our turf/ground. Sometimes dogs will get cherry nose or happy tail. Neither are usually serious but it happens. Do the dogs stay in the kennel unless I pay for walks or daycare? Are there any dogs you wont take? The short answer is "yes". We strive to remain affordable to those with little to no disposable income. Even if you add a walk or daycare daily, our prices will still beat the competition. Walks or daycare MUST be at least once a week! If your dog is extra large, or super energetic, we can require you to pay for walks or daycare more often. This may also happen if you have two large dogs in the same run. That is for the safety of our employees and for the well-being of your pet/s. Walks or daycare can be daily, every other day, every third day, once a week. We do walks and daycare 7 days a week. We accept most dogs and all dog breeds and they do not have to be neutered, however, if they act aggressive or destructive while in our care, we will not welcome them back until they are neutered. We don't accept fence jumpers or any pet recovering from major surgery or in poor health. Females in heat must be boarded alone and pregnant females will only be boarded with the appropriate litter license. We don't accept animals that did not finish their puppy series of vaccines. Yes, tours are available on a walk in basis during non-peak seasons. CHILDREN ARE NOT ALLOWED IN THE BOARDING AREA. We do not do tours when we have a lot of dogs or cats, so please come and see our facility prior to any major holidays, long weekends, spring break etc. Your presence upsets them and when we are busy, we won't be able to take our time and give you a proper tour. Do not bring your pets on tours unless you have their vaccination records along. Why does food need to be labled/pre-packaged? ​Are you open on Sunday? There are several reasons: You can make sure you brought enough food for their entire stay and we won't be accused of over-feeding or under-feeding (though some may be left over if they didn't eat well). We can monitor your pets eating habits better. It saves time for our employees so we can start walks and daycare sooner. If we move your pet from one run to another, their food won't get misplaced if it's labled. Non sealable bags can attract rodents, flies, ants, and roaches. They usually go to the bathroom in the back of their run. Some dogs refuse to go inside but it is not very common. If they do refuse to use the bathroom in their runs, there is an additional "Potty Dog" charge of $5 per day to take them out morning and afternoon for a short potty break. We are open from 4-5 PM for SCHEDULED pick ups only. Pets being picked up Sunday will still be charged that day of boarding unless your pet is getting a bath or groom, or has a daycare package on file. Once all the scheduled pets have departed, the door will be locked. ​Why is there a 4 day minimum stay over some holidays? My dog got sick, What happened? Orkin sprays monthly for fleas and ticks, however, since our walks and daycare are outdoors, ALL pets are required to be on a flea and tick preventative! Having your pet on a preventative like Advantix, Sentinel, or Frontline prior to boarding is mandatory, so if they go home with a flea or tick, I would take it up with whoever provided you the protection. Think of a boarding kennel as an airport. They all come together over the holidays and share their germs just like people. It can also be stressful when pets have never boarded and then are brought during our busiest time of the year. It's loud, there is a lot of excitement, and it's stressful for them. This can cause their immunity to lower. You can mitigate the chances of this happening by taking your pet to the dog park, pet friendly stores, or to our daycare so they have some exposure prior to boarding during our peak seasons. Businesses like ours rely on holiday traffic to stay afloat. The influx of boarders during the holidays helps get us through the many months when the business doesn't make (or loses) money. 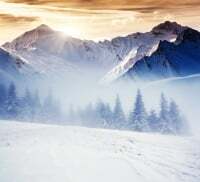 When you only board for a couple of days during the Christmas or Thanksgiving season, we may have to turn away a boarder that would have stayed for weeks. Because of this, we have a four day minimum stay. You can pick up your dog on the 3rd day, but you are charged the full four days. ​Why do we need to pay a deposit? Is it refundable? Do you pay vet bills? If you are happy with our service, we would be happy to receive a tip. Tips for boarded dogs are split among the folks who cared for your pets (daycare and walk personnel, kennel cleaners, and those who handled arrivals and departures). If your pets are groomed as well, tips are split with the groomers. If you are booking on line, that is just the way Kennelink works and there are no refunds. If you are booking during a holiday we ask for a deposit because we turn people away for boarding during those times. In order to have your deposit returned or applied as a credit, you MUST cancel your reservation at least three days in advance. That gives us time to fill the run left vacant by your cancellation. Same day cancels or no shows do not allow us to do that. If your dog got hurt because of us due to negligence, we generally foot the bill for treatment, depending on circumstances. We do not pay for emergency care in non-emergency situations and we do not pay for care that is unnecessary or unrelated to any wound, or infection due to lack of at home care. We also don't pay for kennel cough or other illnesses as there is no way to 100% prevent them or prove your dog didn't bring it in with him. When you sign our contract, you acknowledge this.